It would seem this is how my brother does his school these days.... 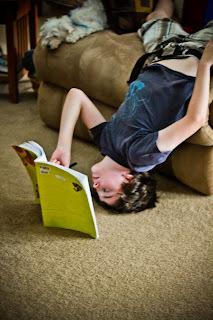 He tells me, "I can think the best when I'm upside down." Reminds me of someone else :P.
Today is Shane's birthday and we're just about to start celebrating. Must go now...icecream cake is waiting =D.